In the past, I used to think that oil blends were a hard task. You had to buy the roller bottle, carrier oil, and the essential oils. It seemed hard to blend them. When I look back, I find myself lazy. This is because I didn’t understand the importance of the roller bottles. When I experience pain on the shoulders or the neck, I use white fir and lemongrass oil plus a few drops of carrier oil to make the spreading of the oils easier across the affected area. However, I experienced two problems when I used that method. The first problem is that one of the essential oils would find its way into a crack between my fingers before I mixed all the oils on my hand. Another problem is that the process seemed to be a hard task, even though I knew the blend could help me. Later I found out that I was ignorant and stubborn choosing not to blend the oils. This is the time I started to think of the roller bottles for my essential oils. Now I love the roller bottles. They are simple and easy to use when blending or applying the blended oils or perfumes. The roller bottles are convenient. You only need to blend once, and you can be able to use them when you want. The bottles are portable. You can easily carry the bottles with you. Just throw them in your bag and go with them where you want. They are ideal for sensitive skin. If you want to dilute essential oils in your favorite carrier oil, you can easily use the roller bottles to dilute and use it on the sensitive area easily. The roller bottles make the dilution process easier. You can dilute warm or hot oils easily. For example, oregano and cinnamon oils are referred to as hot oils, because they can irritate or burn your skin when applied directly. Roller bottles make the use of essential oils on kids easier. This is because the no excess oil will be dispensed and therefore no wasting of your essential oils. You can shake the bottles slightly to ensure that the oils mix well before applying. There are different types of roller bottles in the market. They have different sizes, material, color, balls, and tops. You can choose plain or colored bottles. Roller bottles are made of different materials. Some are made of plastic and others are made of glass. The roller bottles that are made of plastic may be affected by the ingredients inside. Glass bottles are long-lasting and cannot deteriorate no matter how and how long they are used. Plastic bottles may contain chemicals which may contaminate the essential oils. Investing in glass roller bottles is important. An ideal roller bottle should have a dark color. This is because they help to preserve the essential oil properties. The dark color will protect the oil from direct light and prevent alteration of the composition of the essential oils that are volatile through the process of oxidation. Placing all essential oils in dark colored bottles is the best way to keep the oils. Some roller bottles come in sizes of 10 ml or 5 ml. Most recipes require a standard size of 10 ml, and they fit well in the bottles. 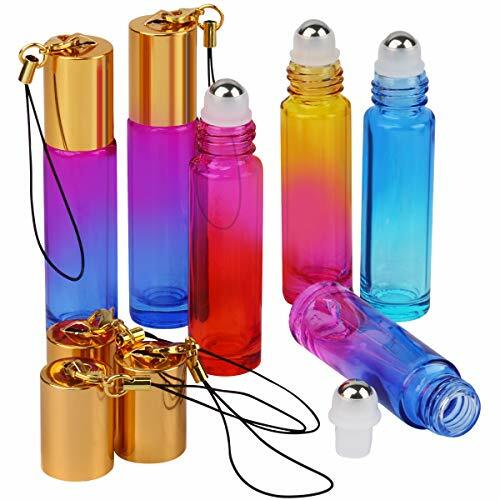 The 5 ml bottles are ideal for traveling. You need to buy the size that you want. Stainless steel balls last longer. The balls made of plastic may not last long, and the oils may break down the plastic after some time. A roller bottle with a removable top is easy to use and refill when you run out of your essential oil. This may help to save money. The glass rollers are of high quality. They cannot break easily even after a long time of use and several travel situations. In a glass bottle, the oil cannot be contaminated by any chemicals from outside. The tip of the roller allows enough oil to be applied. There is no excess oil to worry about any excess oil or spilling. Steel balls make the application process easy and the rolling effect smooth. The package has glass roller bottles with droppers and openers. They are convenient and make the process of blending oils easier. There is a beautiful sling on the lid, designed to help in hanging the bottles at any place. The bottles are designed to store essential oils; they are leak proof. Roller balls tend to be inflexible initially; you can roll the ball inside the oil forcibly, to make it smooth. If less oil comes out than needed, you can press the ball gently and tighten the lid to get inside the oil which comes out smoothly. The bottles should not be cleaned using hot water. Openers are used to close or remove the orifice reducer insert. 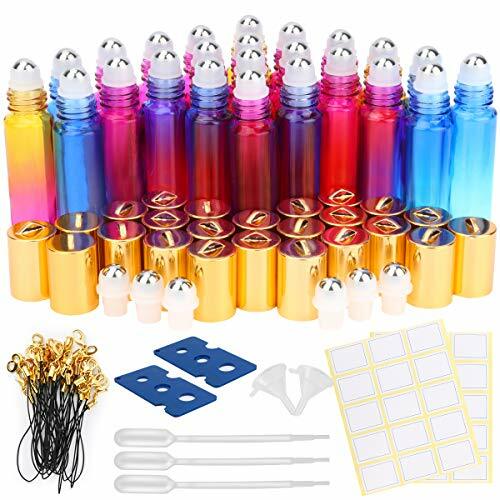 Package contains 24 gradient color roller bottles with roller balls made of stainless steel and hanging lids, three droppers, six extra roller balls, two funnels, and two openers. There are multiple colors. You can easily choose the colors you love. Colorful bottles are easy to use when making your blends. The roller bottles are convenient. They are perfect for perfume oils, essential oils, and other liquids that you may want to blend or use. You can carry the bottles in your bag when traveling or outside. Bottles can be hanged somewhere using the sling on the golden lids. They have a leak-proof design which is also resistant to corrosion. Design makes the bottles smooth, thick, and anti-shock. The bottles are long-lasting. They are made of thick glass that protects the oils from harmful rays and saves it from volatilization. This roller bottles are ideal for homemade DIY blends. They are of high quality at a relatively better price, which makes them great for making essential oil blends at home and for business. You can use them as samples for your prospective clients. Also, they can be great tools for your essential oils or perfume business. They allow users to apply to the last bit of your favorite oils. Use this roller bottles to blend your favorite oils. The oils cannot leak when in the roller bottles. The bottles offer compact storage and can be taken where you want. ESARORA Gradient Color Essential Oil Roller Bottles can be used in different ways. For example, for perfumes, essential oils, and other oil blends. This bottles are easy to use and convenient. They last longer when used well. Also, they are leak-proof, corrosion-resistant and no excess oil when applying.